The Lowrance Elite 5x is a newly introduced fish finder which combines two features together: the DownScan Imaging technology and the Broadband Sounder. As a result, it forms a hybrid dual imaging (HDI) system. This unit is manufactured under Lowrance Electronics, which is also a testimony of the product’s overall quality. 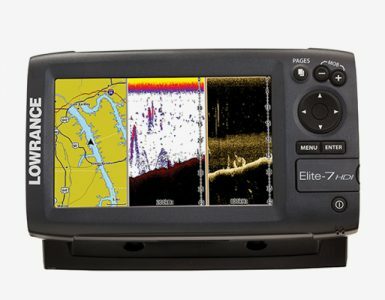 This unit comes with various tested features which have been used on the Lowrance Elite 7x HDI. This only means that you can have access to its different features at a very friendly price. HDI is a new technology in imaging which uses DownScan Imaging and Broadband Sounder. These two award-winning technologies offer a crystal clear view of what is going on beneath your boat. With HDI built-in to Lowrance Elite 5x, there is no doubt that you can enjoy your entire fishing experience. Trackback feature – allows for tracing back history, enabling you to pinpoint some interesting location using a waypoint. DownScan Overlay Technology –uses DownScan imaging which supports the Broadband Sounder technology. Selector Menu All-in-One page – allows for access of all the available features with just a single thumb operation. Multi Window Display – allows you to select from different pre-set page layouts while still looking at the sonar. Transducer – Transom Mount Transducer – 83/200 45/800 kHz. Judging all of the features that are included in the Lowrance Elite 5x, it can be said that this unit really offers value for the money. A lot of feedback coming from other users testify to the fact that it can even par up in terms of quality with other higher models that are being offered in the market these days. The main advantage of this model when compared to such brands is the fact that it is very affordable. 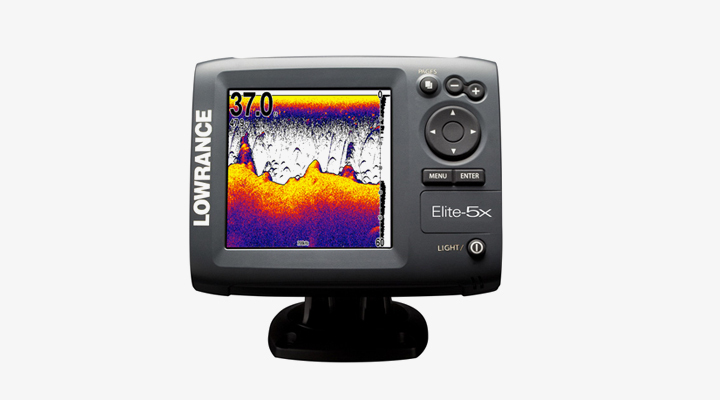 There is no question that the Lowrance Elite 5x is a solid and complete fish finder. This should be considered strong if you are currently in the market for upgrading or purchasing from a previously owned model. One major competitor of the Lowrance Elite 5x is the Lowrance Elite 5 DSI, a fish finder which is also under the same manufacturer. The main difference between these two units is that the former does not have a chart plotter. However, when it comes to image clarity, the Elite 5X uses HDI combines DownScan Imaging and Broadband Sounder. On top of that, the HDI model costs about half of the actual price of the DSI option. This margin of difference is its main advantage, considering that the features are mostly similar. 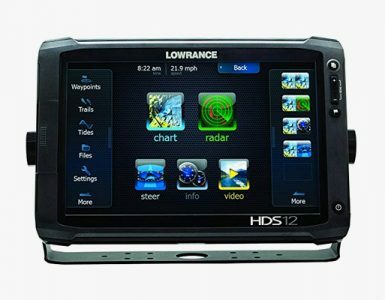 Another competitor is also from the Lowrance company: the HDS 8. In its own way, this model has also been praised in the fishing industry for its features, such as a combination of being a broadband sounder and a chart plotter. It is also equipped with an internal GPS sensor. The package also comes complete with the necessary equipment needed for the unit. All in all, the Lowrance Elite 5x is still the best option available, thanks to its very affordable price. However, it does not mean that because this product is affordable, the quality is already compromised. As a matter of fact, this unit is jam-packed with different features that would certainly prove to be useful for both amateur and professional anglers. The best thing that you can do at this point is to identify your personal preferences as well as needs in order to come up with the best decision possible. No question that Lowrance has done it once again with the introduction of the Lowrance Elite 5x model. This unit combines the best of the best out of Lowrance technologies into a single package for fish finding. If you have already experienced using a Lowrance before, you can definitely prove that their DownScan imaging is one of a kind. At the same time, their Broadband Sounder also works wonders. When these two are combined together to form the Hybrid Dual Imaging (HDI) system, you can certainly expect a high-resolution unit. This new unit comes with a power rating of 250 watts. It also claims that you can actually see as far as 1000 feet down at 50 kHz. This is certainly a very impressive number. Since most fish may be located in shallower waters, this unit can serve as your one-stop solution as it can provide you with clear and crisp details of the structure, bottom, as well as fish schools via its 5-inch high-resolution display. 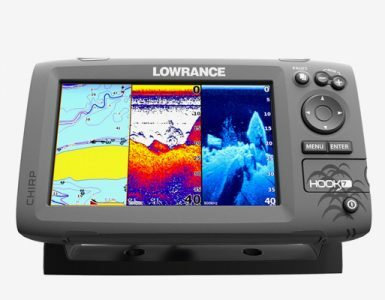 This model is another version of its sibling, the Lowrance Elite 5 HDI. The main difference, though, is the fact that this model does not come with GPS. If you already have your own chart plotter, or perhaps you are currently on a tight budget, then the Lowrance Elite 5X is definitely a great choice. This new series also introduces the recreational angler version which is new to the higher-end Lowrance HDS series. Therefore, if you are searching for good quality performance but you do not want to bring a complete computer package on your boat, then this HDI unit is your best option. The Lowrance Elite 5x is highly recommended for anglers and fishermen who want to have different features that are commonly found in more expensive units, such as high-resolution SONAR and combo broadband; this time, in a more economical and compact package. It can be easily used on boats of different sizes, as well as with kayaks and even rigs and small boats.